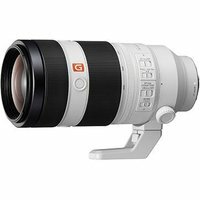 The Sony FE 100-400mm f/4.5-5.6 OSS G Lens is a high-end super-telephoto lens from Sonys flagship Master series. Offering an extremely sharp image over its full focal range, this lens offers incredible versatility making it ideal for sports and wildlife photography. An innovative autofocus system comprising floating focus with double linear motor and DDSSM systems achieves precision and speed.